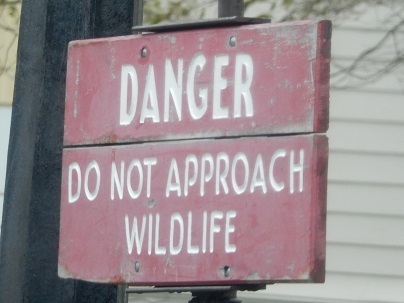 Please do not hug the dangerous wildlife …! This week social media was afire with news that a child fell into a gorilla enclosure at the Cincinnati Zoo, with the result that a male lowland gorilla was shot to protect the child. This is the third time a toddler has fallen into a gorilla enclosure. Comments on social media blamed the parent for not minding their child, the zoo for shooting the gorilla, and a few also blamed the zoo for not building a safer enclosure, which would prevent toddlers from being able to enter. I did not notice, however, any comments on how the public often perceives potentially dangerous wildlife – as something that is safe, and not actually life-threatening. A couple of weeks ago social media was ablaze when members of the public picked up a baby bison at Yellowstone National park and put it in their car, echoing a similar event in Shoshone. Selfies with dangerous wildlife have also become increasingly common. 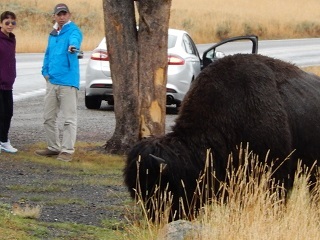 Tourists frequently take selfies with Bison at Yellowstone Park , and despite the fact that 5 people were injured by bison as of July 2015, I observed tourists taking selfies next to bison twice while I was there in September 2015, with one set of tourists actually taking selfies while standing next to a dangerous wildlife sign (shown above). Selfies with seals have become so common that the NOAA had to issue a statement warning about them . The public think little about the dangers of taking a photo of their kid next to a marine carnivore, with big pointy teeth, nor putting their child on the back of a 4000 Lb + male elephant seal, for a photograph, despite the fact that these latter animals routinely crush and kill considerably less fragile elephant seal pups and juveniles on the breeding rookery. Such animal selfies are not just dangerous for the public, but recently a mass crush of tourists trying to take selfies with a young, stranded franciscana dolphin may have led to the death of the poor animal. Why do members of the public think that wildlife is there to be poked and prodded and gawked at? Why are they so surprised when wild animals attack and injure – or have to be put down after encounters with humans? The disconnect between potentially dangerous wildlife and risk to humans is perhaps most visible at places like SeaWorld, where trainers used to pet and ride large marine predators, and historically would even place children on their backs. The case of Tilikum the killer whale at SeaWorld Orlando is a prime example – his tank-mates were routinely hugged, kissed and swum with, leading one member of the public to think the big male was safe enough to swim with (Daniel Dukes, who was found dead, draped across Tilikum’s back, in 1999). Tilikum eventually killed his trainer in February 2010. This all happened despite Tilikum having killed another trainer previously (in 1991) (Parsons 2012). Moreover, another killer whale owned by SeaWorld had killed a trainer just a couple of months before the Feb 2010 incident, in December 2009, although this whale was in the Canary islands (Parsons 2012). Yet these animals are portrayed as being safe, and even friendly, by the zoo and aquarium industry. Why do people not understand that wildlife is exactly that …wild? Perhaps it is because animals are frequently portrayed as being there for our entertainment and enjoyment…by zoos and aquariums. Last week I was at a reception on Capitol Hill, organized by, and on behalf of, the Association of Zoos and Aquariums (AZA), and this dominionistic/humanistic (Kellert 1980) view of wildlife was there in spades. Wildlife was there to be hugged and to take selfies with! 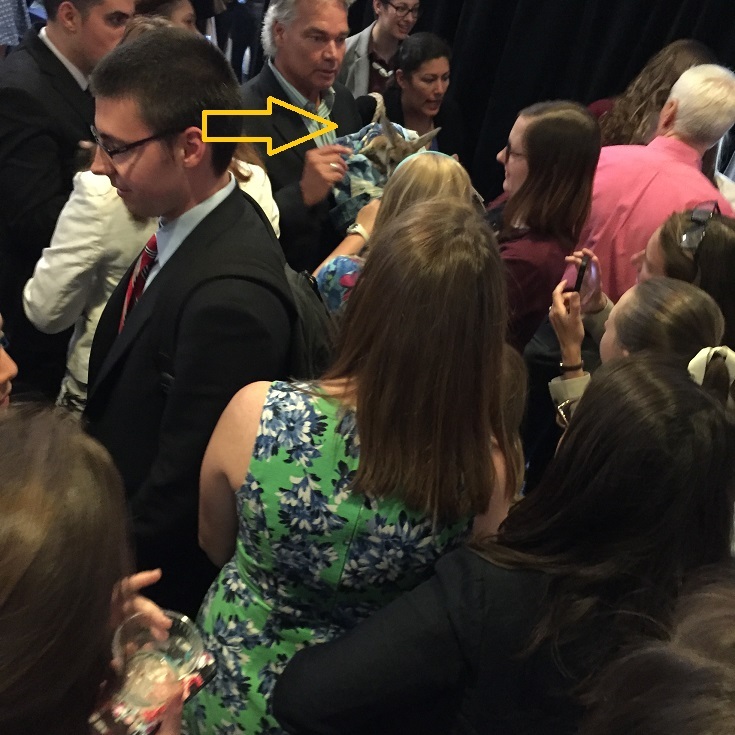 The poor animals were faced with a crush of people handling them and dazzled by a barrage of camera flashes. The whole event was hot and claustrophobic for the human participants, let alone for the wildlife. 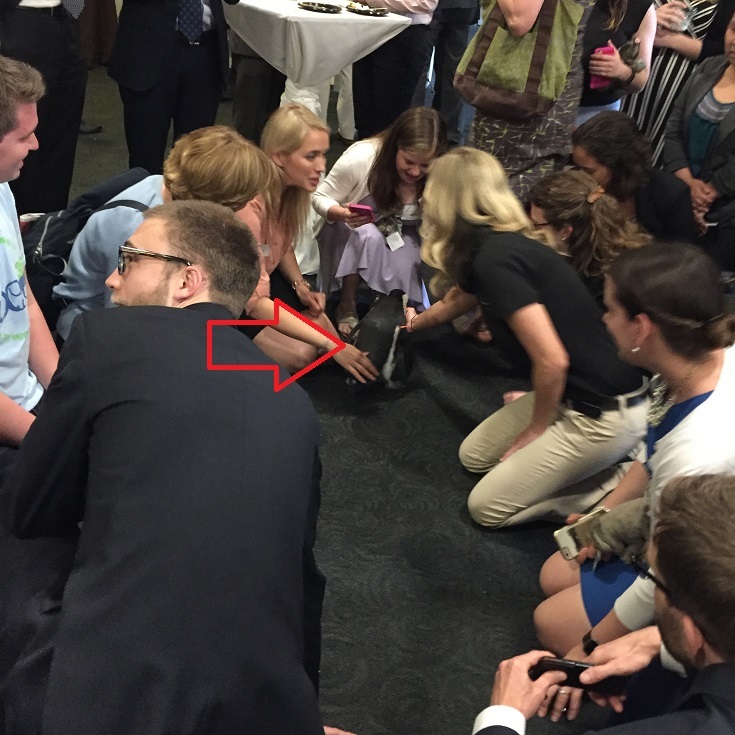 Is it really surprising that the public has a skewed view of wildlife when the leaders of the zoo community are encouraging people (including policy makers) to view wildlife as if they were pets to be petted and hugged? Wild species are not stuffed toys to cuddle, they are not your pets, they are not props for your photos. They are potentially dangerous, they are sentient, and they should be respected. Kellert, S. R. 1980. American attitudes toward and knowledge of animals: An update. International Journal for the Study of Animal Problems 1(2): 87-119. Parsons, E.C.M. Killer whale killers. Tourism in Marine Environments 8(3): 153-160. Sigh. On the bright side, for me it makes White Sharks easier to characterize for my passengers though I hope that none of them ever feel that they are completely safe around White Sharks. That would mean I’m not entirely doing my job. While sharks are potentially dangerous animals, nowadays, the public has a better chance of being killed or injured by yet another species other than a White Shark. Not leaving out buses, banana peels and large boxes on overhead shelves. Wild animals are wild. Just as Chris notes. A little respect for them is required as is education for people viewing them. For those looking to interact, hopefully they will start reading up. Large animals in general often injure people. Horses, cows and other larger and smaller quadrupeds account for huge amounts of injuries. Why there is such a disconnect between the understanding that a person can be hurt and the idea it’ll be fine to go up and touch a wild animal when even the common house cat and pet dog can, and often do leave a bloody body part on a person is something I wonder at more and more.